UPDATE 11:40PM — Charges filed. Full report HERE. 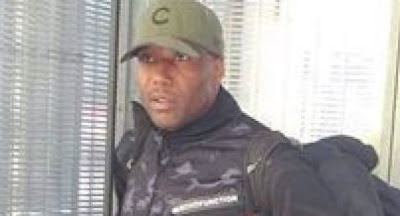 Police have detained a man who appears to be the person sought for punching a woman and causing her to fall onto the Belmont Red Line station tracks Friday afternoon, according to a source. CPD officials were not yet able to confirm details of the arrest. A little after 2 p.m., a CTA worker noticed a passenger who looks like the wanted man sitting in a Brown Line train car at the Kimball station, 4755 North Kimball . Police were notified and the CTA held the train until officers arrived. The man was described as wearing the exact same clothing seen in a widely-circulated photo of the suspect: an olive green baseball hat with a black jacket. Police tactical officers from the 17th (Albany Park) District arrived quickly and detained the man. They said the man was “positively identified” in a transmission to dispatchers overheard on police radio. A source with knowledge of the circumstances confirmed that the man taken into custody is the same as the person seen in the “wanted” photo. The source spoke on condition of anonymity because they are not permitted to speak about official matters with the media. In an interview on Saturday evening, the victim told CWBChicago that she took a photo of the man after he threatened her during a confrontation. That impulse may have paid off this afternoon. CWBChicago will continue to update this story as it develops.